A stunning flowering vine with brilliant deep yellow five petaled flowers, with deep black eyes Thunbergia alata are commonly called 'Black Eyed Susans'. The flowers are not fragrant, however they make up for this with colour. Grown mainly as an annual in the UK , Thunbergia alata will reward you with masses of showy flowers from early summer through to the first frosts. As soon as the frosts hit, the show is over. From a group of tropical climbing plants Thunbergia alata is the the best known, but not the only species. The plant has much natural variation in flower colour, you will see seeds offered with flower colourd ranging from a pale lemon yellow, to yellow flushed with red and apricot. 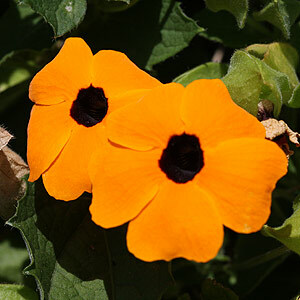 Thunbergia alata (pictured right) is perhaps the most commonly grown species and although it requires protection from the cold it can successfully be grown in hanging baskets on patios and outdoors in containers in a sheltered position. 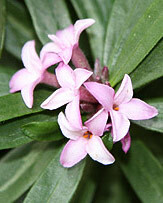 In the past they have been regarded as a conservatory plant where they could be kept going almost all year round. Today they are used as annuals, planted out as soon as the frosts are over. 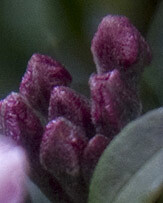 A sunny position in the garden, in a hanging basket, or in a container with a growing frame of some sort. They will need something to climb on, so a frame around 1 - 2 m tall will suit. In hanging baskets, let them climb up and them cascade down, you can always prune away any growth that is to long. 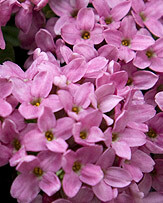 Grow from seed or young plants available for sale in spring. Best grown from seed planted in spring, keep moist and well fertilised and provide some support for the climbing habit and allow it to scramble up 1m or so. Thunbergia grandiflora with its sky blue to mauve flowers is known as the 'Bengal Clock Vine' , the flowers have a white to pale yellow throat. 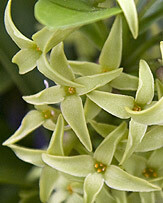 The flowers are large and trumpet shaped, heart shaped heavily veined leathery foliage, a brilliant plant. However it is one for the conservatory or an enclosed patio. 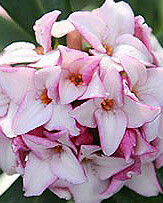 Also available in a white flowering form. Thunbergia battiscombei is more difficult to grow, however it does have brilliant blue flowers, more of a scrambler than a climber, and well suited to hanging baskets. Thunbergia mysorensis is spectacular, a definate conservatory plant. It climbs and then the flowers trail down, and what flowers they are. Brilliant 'dayglow' yellow and crimson red. Any winter temperatur e below 10C is problematical.